I'm not really going to review The Great Gatsby, because I'm sure most people would either have read it already, or at least have a working knowledge of the story. Surprisingly, this book somehow slipped past me in high school as required reading, and I'm glad it did as I don't think I would have enjoyed it as much, nor understood it as well, but when I heard about the Baz Luhrmann film production, I knew I was going to go see the movie (I love Luhrmann's films) and decided I should familiarize myself with the original. I found it on Audible (narrated by one of my favorite actors, Jake Gyllenhaal), so I downloaded it and gave it a listen. What I discovered in the story surprised me. I didn't know what the story was about, but I wasn't entirely sure I was going to like it. I felt it was one of those books that I avoided in high school, and there was probably a reason for it. I found myself really capitvated by the story. 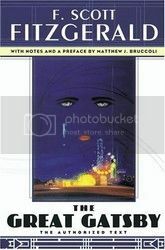 The story of Nick Carraway as he is sucked into the extravagances of his neighbors in the Jazz Age city of New York; the story of Jay Gastby, and the mystery surrounding his impossible wealth; the love story of Jay Gatsby and Daisy Buchanan, and what that love means to Daisy's family. It is all these things, and so much more, all layered together into a subtle and nuanced story that I'm certainly glad I came to in my adult years, as I was able to appreciate it more. As for the audio production, Jake Gyllenhaal really captures Nick's semi-detachment from what's going on around him perfectly. There isn't much emotion in Gyllenhaal's performance, but it's done that way on purpose, as Nick is remembering back with some level of revulsion about what happened during that time with Gatsby. It's not an easy performance to listen to, but I don't think it's supposed to be, just like the book itself isn't the easiest story to digest. A pretty spot-on performance in my opinion.